As an online business owner, you already know of the struggle in selecting the right ecommerce platform for your website. So many options, so many choices, so many companies offering a plethora of products and services all seemingly homogenous at first glance, but different and quite varied upon further investigation. Of the myriad of competitors on the market today, two of the biggest and fastest-growing ecommerce SaaS platforms are BigCommerce and Shopify. These are currently the two dominant names in ecommerce and many online merchants, both big and small, are finding themselves debating as to which platform to use for their respective businesses. 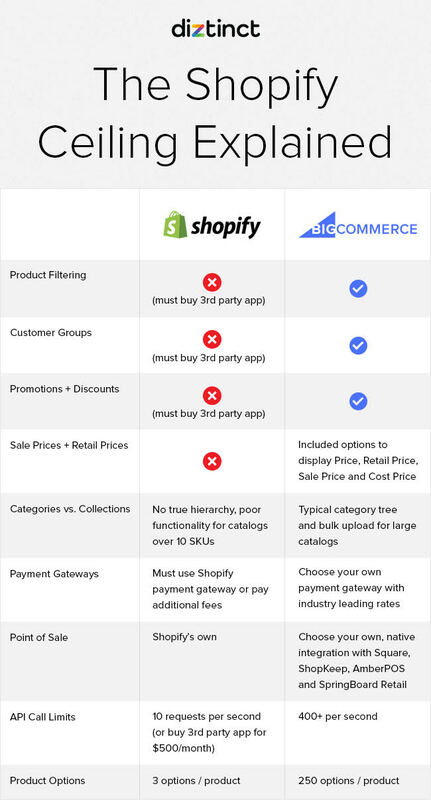 Tech writers and industry bloggers have already spent countless words and paragraphs comparing the basic differences between BigCommerce and Shopify: Pricing; Features; Themes; Etc. So, rather than revisiting the previously charted territory, we’re going to compare these two platforms from a different, and more critical, perspective: Growth Potential. Shopify’s and BigCommerce’s respective features and ease-of-use make both platforms attractive to small merchants who are just starting to venture into ecommerce. But who wants to make the wrong choice at the start, especially if you don’t have to? What happens when the small merchant grows to become a larger establishment, suddenly struggling to add functionality they didn’t know they needed as a smaller business? What does the multinational Fortune 500 corporation do when they want to streamline their operations and go with a more cost-effective SaaS solution? Which ecommerce platform is appropriate for these types of businesses? Once you compare the functions and features of BigCommerce and Shopify, it quickly becomes evident that Shopify is not designed to accommodate the demands of larger merchants as well as BigCommerce can. 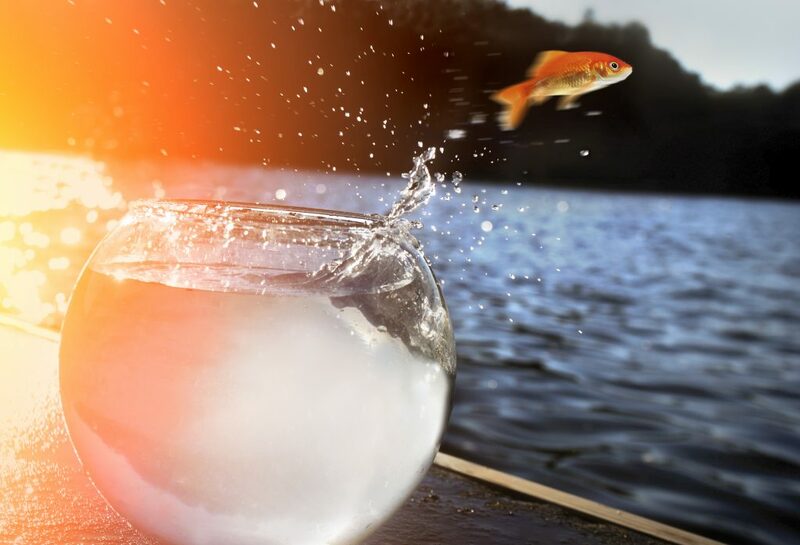 Much like how goldfish can only grow to a size that’s proportionate to their environment (small tank = small goldfish), we consider there to be a growth cap –– or ceiling –– on Shopify. When Shopify first launched in the Summer of 2006, their goal was to simplify the process of creating an ecommerce website so that anyone, regardless of skill level, could open their own online store. They accomplished this by reducing the amount of customization options and stripping the platform down to its bare essentials. While this lowered the learning curve for novices and beginners, experienced ecommerce professionals discovered that many of the common features that they’d come to expect and use regularly had been eliminated. As a Shopify merchant develops into an established business, these features become a necessity and in order to compensate for their absence, the merchant is forced into purchasing supplemental apps and add-ons from a third-party developer (or developers). This can be problematic for a number of reasons. For starters, apps can be expensive, which leads to increased spending and that spending will definitely increase as more and more apps are incorporated into the site. Second, as apps are engineered by various developers and sources, they have the potential to cause compatibility issues. Not all apps play nice with each other and can actually reduce the system’s overall efficiency. Now, the merchant is stuck having to contact each individual developer for user support. Shopify offers a rudimentary filtering feature out of the box. However, it is limited to only 3 filter groups and requires additional coding to set up on the site. If you want more advanced filtering, you will need to purchase a third-party app. BigCommerce offers product filtering (they call it Faceted Search) with up to 12 filter groups. The filtering takes product variants into account as well so you can offer filtering on variants like size and color. The Faceted Search option is only available on the top tier plans, but if you are a fast-growing or established merchant, you’ll probably be on one of those plans anyway. Shopify does not offer customer group level functionality out of the box. You can filter customers by searching your customer list for things like total order amount or location, but there is no way to create multiple customer levels and assign specific customers to specific levels. You’ll need a third-party app to accomplish and these apps range from $50 – $300/month. Restrict customers from seeing any or all categories in your stores. Create discounts for specific categories for a group level. Create discounts for specific products for a group level. Create storewide discounts for a group level. A specified dollar amount or percentage off the following: All orders, orders over a certain amount, a collection, a product, a product variant, or a certain group of customers. The other discount code option is free shipping on an order. Over the past year, BigCommerce has invested a lot of time and development in the area of promotions and discounts, and their efforts have paid off. With BigCommerce you have the choice to create either coupon codes or cart-level discounts. For coupon codes, BigCommerce offers similar features as Shopify. However, you can also offer a dollar amount off each item in the order, instead of just the order total, as well as restrict the coupon to a location based on the shipping address, and limit the coupon based on the shipping method selected. Apply tiered discounts to things like order subtotal (based on the order value), and applicable products based on quantity of items ordered. This cart-level discount feature is one of the most advanced, if not the most advanced, promotion tool available out of the box across the SaaS ecommerce landscape. In order to get something close to these promotional rules on Shopify, you’ll need to purchase more than one third-party app. The category tree is a feature that Shopify attempted to simplify with their “collections.” There are a few benefits with collections like being able to spin up a featured collection quickly and use a product tag to quickly populate it. But overall, collections falls short for more established merchants with large category trees. Collections have no true hierarchy like categories and sub-categories. Therefore, you have to manually build a navigation tree in order to create some semblance of a category tree. The problem is that the system doesn’t recognize this as a true hierarchy so things that require a hierarchy to function probably, like breadcrumbs and sub-category page URLs, don’t work well when you are trying to build collections that have multiple levels. Another issue that I alluded to earlier is that collections have to be set up manually. The reason is because you need to tell Shopify how to filter the collection in order to display the right products. This isn’t a problem for a seller with 10 categories; however, this becomes a tedious process for a seller with 200 categories and 300 brands. BigCommerce has opted to stick with the typical category tree functionality that most online merchants are used to. You can create your category tree and then assign new SKUs to the categories and sub-categories that they belong to. Also, if you use a spreadsheet to bulk import products or an external product feed, BigCommerce will automatically recognize new categories and brands and will add them to the system for you. So no need to go into the system every time you have a category or brand and manually create it. Price fields is another area where Shopify has taken simplification too far. They are missing a key price field – the sale price. However, instead of offering a third price field for a sale price, they tell you to use the Compare at Price field. This isn’t a problem if you sell products at retail price or products that don’t have a retail price. Unfortunately, this isn’t the case for most merchants. Many of the ecommerce sites that we build include a price and a retail price. The merchant wants to display the savings of their price compared to the retail price. But when they want to put an item on sale, as well as display the “regular price” and the “retail price,” this cannot be accomplished in Shopify. BigCommerce has taken the more common approach to pricing. They offer pricing fields for Price, Retail Price, Sale Price and Cost Price. It’s that simple. Another area where we see the Shopify Ceiling is in Shopify’s attempt to limit choices for their customers. This is most apparent in their payment gateway options, and the point of sale offering. Shopify has built their platform around their own payment system. This is great for smaller sellers that don’t want to deal with the hassle of selecting and setting up a third-party payment gateway, but what about larger merchants that need to use a specific payment gateway? Or the merchant that has negotiated a better rate with an external payment software? If you are on Shopify and you need to use an external payment gateway, Shopify penalizes you. You will be charged a transaction fee if you decide to decline Shopify Payments and use your own payment gateway. Not a smart way to sell yourself as an ecommerce platform for larger merchants. BigCommerce has decided to take a different approach. They don’t offer their own payment gateway like Shopify. Instead, they have partnered with many payment gateways to allow the merchant a wide selection of ways to collect payments on their websites, and there is no penalty for using your own external payment gateway. Similar to Shopify Payments, Shopify has built their own POS system as well. This can be helpful for smaller merchants that don’t need a lot of features or options, but it can be a roadblock a larger merchant that already has a POS system in place. BigCommerce has decided to partner with several POS systems including the most widely used POS system in the industry, Square. Together they have developed a native integration and seamless connection between your BigCommerce website and your Square account. BigCommerce also integrates with AmberPOS, ShopKeep, and Springboard Retail. The third indicator as to whether an ecommerce platform can handle large merchants is extensibility. In other words, how customizable is the system? Typically, as an online merchant grows the need for custom features increase as well. Since both Shopify and BigCommerce are SaaS platforms, it means that they control the server and hosting as well as lock developers out of certain core files. This restricts the customization that can happen directly on the server and core files. So in order to properly compare extensibility, you need to look beyond the core system and compare the APIs and Product Option capabilities. Both Shopify and BigCommerce offer product catalog APIs as well as APIs for other information like order data and customer data. But when you dig a little deeper and compare the capabilities on both platforms’ APIs, you start to undercover limitations on Shopify’s API. These limitations can severely hamper the customization and scale of the APIs that you may need in order to build custom features. BigCommerce claims their API “processes updates up to 100x faster than Shopify Plus.” Let’s break this down. Shopify uses an algorithm called “leaky bucket.” Theoretically, this API controller allows you to make unlimited amount of calls but over a period of time in bursts. On top of that limitation, you can only update one order or product with one API call. Therefore, let’s say you have an API that needs to update 2,000 products, so it needs to make 2,000 API calls. If we subtract out the initial burst of 40 API calls and then divide the additional 1,960 API calls by 2 per second, it will take 16 minutes to update a product catalog of 2,000 SKUs. Not terrible, but what about a product count typical of a larger merchant? Let’s say you are a merchant with 50,000 SKUs and variants. And let’s say you are on the Shopify Plus plan where you get up to a max of 10 requests per second. Even with 5 times more calls per second it would still take almost 2 hours to run the Shopify Plus API. BigCommerce’s API is more robust and the API call limits are much higher. BigCommerce’s Pro Plan allows 60,000 API calls per hour. That means a product catalog with 50,000 SKUs would complete in about 50 minutes. For those on BigCommerce’s Enterprise plan, BigCommerce’s API can process over 400 calls per second and complete a 50,000 product catalog within 2 minutes. So BigCommerce’s API claim that they process updates up to 100x faster than Shopify Plus holds true when you compare Shopify’s max 10 requests per second to the 100+ requests per second with BigCommerce Enterprise. And for larger merchants in need of API connections to external systems or databases, the additional speed and power of the BigCommerce API is critical. Note: You can use a third-party Shopify app to get additional API call support. Those apps cost an additional $500 per month, on top of your regular SaaS costs for the Shopify Plus platform. Many online merchants sell products that have multiple variants like color and size. Some merchants have product that require many combinations of options. Shopify limits product options to 3 different options (i.e. Size, Color, Width) and a max of 100 combinations of those options (i.e. a pair of shoes might have a combination of Size: 10, Color: Black, Width: Medium.) A pair of shoes with product options for size, color and width would easily surpass Shopify’s 100 combination limit. In comparison, BigCommerce allows up to 600 SKUs per product. Assuming that each product option combination represents 1 SKU, this would allow you to create up to 600 product option combinations. You can also have up to 250 options per product. Furthermore, you can create a variety of option types like multiple choice, checkbox, swatch, text/number field, date field and file upload field. Shopify only allows dropdown or rectangles by default. If you want to include text fields for things like engraving messages, you’ll need a third-party app. As evidenced by the three points discussed above, BigCommerce offers a much more enriched and fortified ecommerce solution for growing businesses and established companies alike. The range of native features, available options, and freedom to modify allows you to custom-tailor your website to best suit your specific needs in creating an efficient and effective online retail experience. If your needs go above and beyond Shopify’s limitations below, you have reached the Shopify Ceiling. Let me know if you have any comments or questions. I’m happy to help you with any needs for your store on any platform, even if you haven’t yet hit the Shopify Ceiling. Wow, excellent analysis and explanation! I always heard that Big Commerce was for the larger sized businesses, now I know why. What’s great is that you pointed out some cool features that smaller sites like ours can use on our site such as the cart level discounts and customer segmentation possibilities. Great Article and On Point. I am in the process of changing two of my stores from Shopify to BigCommerce. This helps validate my choice. Thank you!